Yay, it's Friday! 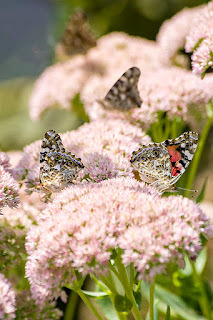 Fridays are all about the bokeh so this shot of a few of the many Painted Lady Butterflies in my yard is appropriate. They are really enjoying the Autumn Sedum, that has been one of the best plants for attracting butterflies. I have also posted a video on Youtube HERE where I captured them flying around the Sedum. There has to be a good 50 of them at least. It's really magical to walk by and have them all flutter around. I'll be sad when they all finally leave.